What’s more summery than berry lemonade? We drank this on our vacation along with fish tacos made from freshly caught salmon. Unfortunately I hate fish, but that’s a story for another time. This beverage was another small success in my efforts to make up more of my own recipes. 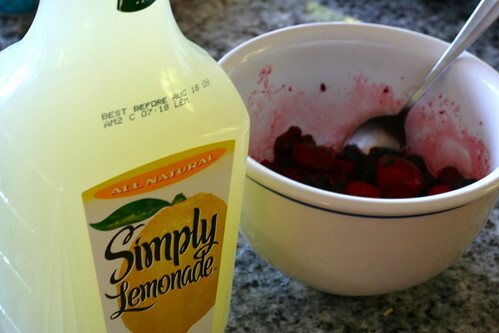 It uses some ready-made ingredients (next time, lemonade from scratch! ), but I’m still taking baby steps! This is so easy and would be great to serve at a summer BBQ or picnic. Toss frozen berries with sugar in a small microwaveable bowl. Heat on high in 30-second increments until defrosted and juicy, stirring after each increment. 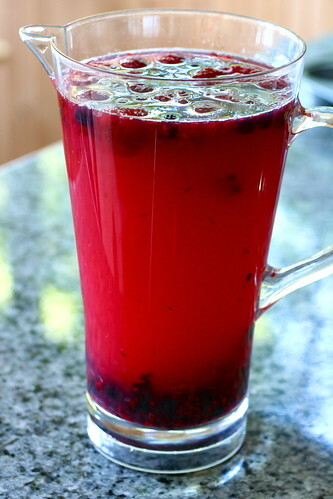 Pour berries along with their juices into a large pitcher, and pour lemonade over berries. Refrigerate until ready to serve. 2) because I love Lemonade. It's gorgeous! I love the color--this must be so refreshing. And you know, sometimes you just don't feel like squeezing a million lemons to make one pitcher of lemonade.